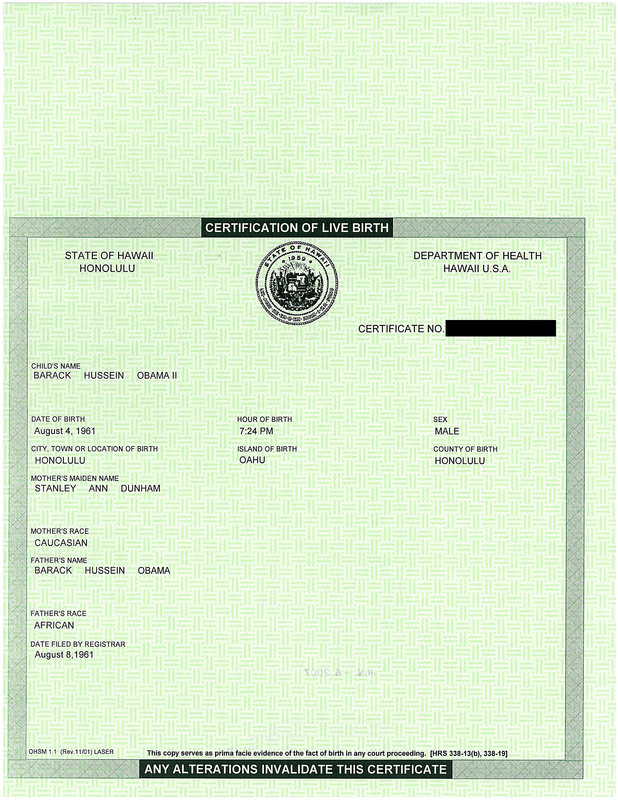 Thinking back over the past year, I think no single event more influenced the birther movement than the release by the White House of a certified copy of Barack Obama’s original Certificate of Live Birth from Hawaii, shown here in a photo taken by NBC News correspondent Savannah Guthrie at a White House news conference. The document’s release in April had two almost immediate consequences. First, many casual doubters, those whose doubts stemmed primarily from the fact that the President hadn’t responded to demands to release the document, were satisfied that Obama was born in Hawaii just as the Encyclopedia Britannica said. 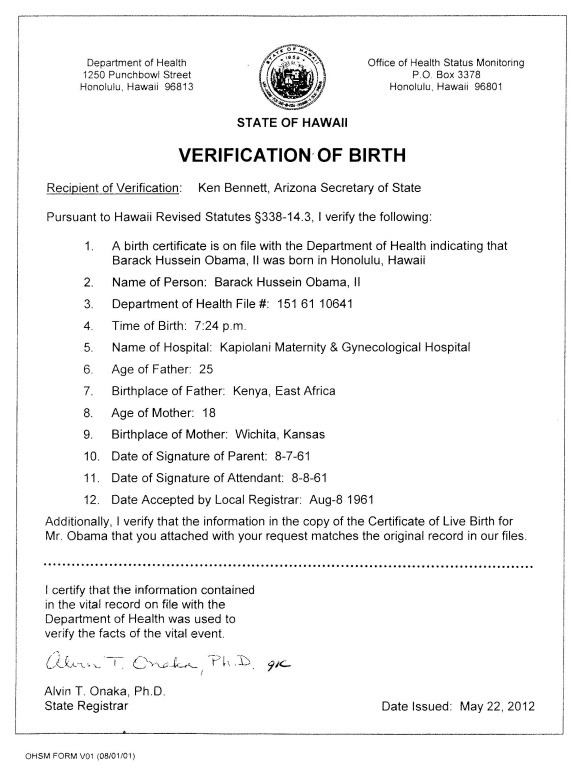 The long-form certificate refuted claims that Obama’s registration was fraudulent, submitted by a relative: it clearly shows Obama was born in the Kapi’olani hospital and delivered by physician David A. Sinclair. Birther poll numbers dropped sharply. The presidential aspirations of real estate mogul and TV host Donald Trump (who some credit with forcing Obama’s hand in releasing the certificate) were dashed as Trump’s TV appearances questioning Obama’s place of birth backfired in the light of new evidence. Author Jerome Corsi, whose book Where’s the Birth Certificate? was about to be released, also became a laughingstock. The second result was that the remnant birthers began to make new claims that the newly-released Certificate was a fake, despite official statements from Hawaii to the contrary. 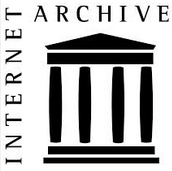 WorldNetDaily published articles from many self-proclaimed “experts” claiming that various artifacts in the PDF file image of the certificate from the White House web site proved it was a fake. This lead to the publication of the first book specifically to take on birther claims, John Woodman’s Is Barack Obama’s Birth Certificate a Fraud? Tea Party conservative Woodman made quick work of debunking the fraud claims. Over time Birther emphasis shifted from the place of Obama’s birth (as a growing consensus rejected the born in Kenya theory) to his parentage where they were on more factual ground. 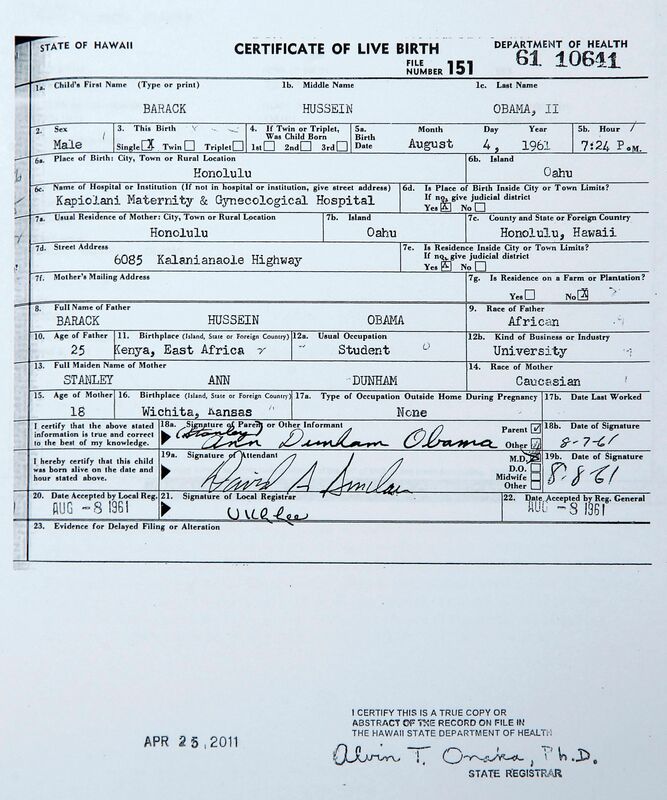 The President’s father was undisputedly not a US Citizen. However, all recognized authorities who have commented on presidential eligibility have said that persons born US Citizens in the United States are unquestionably natural born citizens, as required by the Constitution. If I may be so bold, I predict that the year 2012 will be “the year of the ballot challenge”, with birthers focusing their efforts on proving their claims in court cases related to the President being on the 2012 Presidential Ballot. Speaking of the two US parent thing, there was a recent Freepy thread with a string of conspiracy theorists again making the claim that they learned of the two US citizen requirement in civics class. I assume these people are many decades removed from grade school and at best are misremembering, but has anyone ever found curriculum materials to support this claim? The other interesting thing is that birthers seem curiously resistant to trying to find any such textbooks. You’d think if they honestly believed that is what they were taught, there would be an all out effort to retrieve such materials. Yet every time it is suggested that such a claimant find and produce the textbook, or any textbook, that shows that is what they were taught, avoidance kicks in. As Daniel said, no such textbook has surfaced to my knowledge. If it did, you can be sure I’d publish the information as soon as I learned about it. (Books published since 2008 don’t count). Actually that is no true. I read a book in a library at a public school that I was recently at called the Encyclopedia of the US Constitution. It was a reference book in the library. In the book, it explains in detail all of the Articles of the Constitution including Article II Section 1. It notes that only a “Natural Born” citizen can be president. However, the book left reader with a disclaimer and a warning. Does Natural Born Citizen mean simply being born in the country or does Natural Born Citizen mean being born in the country of US Citizens. The book did not claim to make an affirmative answer either way. I really appreciate your reference that I’ll be interested in following up. Am I correct that you are referring to the book by David A. Schultz? If so, then it technically doesn’t qualify, having been first published in 2009.
john: Actually that is no true. I read a book in a library at a public school that I was recently at called the Encyclopedia of the US Constitution. I can’t confirm if this is the book. It could be. I don’t know. Why don’t you put it on your “To Do” list to go back to that library and find out? Next time you try to make such a loose claim, please try to have the good sense to grab all the proper bibliographical data to cite your reference. Without that, your claim is as useless as an urban legend passed along in a chain email. I can’t confirm if this is the book.It could be.I don’t know. If you want your comments to be believed, then you will have to nail down your sources. In this case, I can’t find another book with the exact title you gave, so I’m going on the assumption that Schultz’s book is it. I’m willing to put in the effort to look it up and I have put in an interlibrary loan request for the book (could take a couple of weeks). I’m doing this because so far birthers have not been able to support their claims that they learned about the two-citizen requirement in civics class. None of the birthers learned this in high school from a book published in 2009, but still the reference (if accurate) is important. Here is Prof. Schultz speaking on Fox News about Donald Trump, back when Trump was a candidate for President. john: I can’t confirm if this is the book. It could be. I don’t know. Actually civics and the concept of citizenship with anything having to do with the meaning of Natural Born Citizen or the eligibility to be the POTUS was never discussed in my school days; at least I can’t recall anything. The only class I took was American Government and I don’t remember anythng of the sort being mentioned. About the only thing I vaguely recall was that the POTUS had to be a US Citizen but I don’t remember anything going deeper than that. 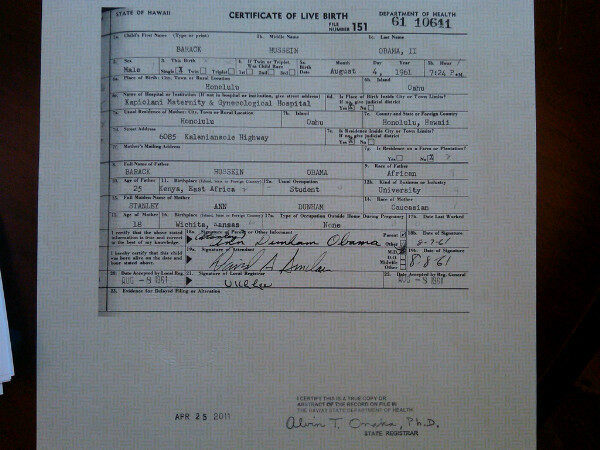 Birther claims may or may not be true from what they learned for Civics class. But Birthers do claim to have learned that the POTUS has to be a Natural Born Citizen – which by definition includes to 2-parent requirement; perhaps such a more detailed explanation may have not been necessary beyond the fact that the POTUS has to a Natural Born Citizen. I concur that discussion of the term “natural born citizen” is rare in education. I recall working through the Constitution in a civics class, and reviewing the requirements of various offices as mentioned therein. I recall it was noted that the President had to be a “natural born citizen,” meaning the President “had to be born here”. No further discussion of the term was held, then, or in all my days until coming across the ravings of birthers. Why not? Because it’s stupefyingly self-explanatory, that’s why! LOL! Courts have heard and ruled various cases, much discussed here and elsewhere, in which certain fine points needed ironing out. That which is obvious does not need ironing out. G: Here are some other great end of the year recaps on Birtherism. Oh, it’s too much …. too much …. thankfully I can rely on OCT for the condensed, lite version. Thanks for a glimpse of the abyss, G. Sure didn’t help my headache tho …. ! The really stupefyingly ridiculous part of the two-citizen-parents claim is that it attempts to bring back one of the attributes of colonial England that the founding fathers found abhorrent, that being the idea that who your parents were determined your “station” in life. That is an alternate name for ‘civics’. My school called it that too. john: About the only thing I vaguely recall was that the POTUS had to be a US Citizen but I don’t remember anything going deeper than that. Really? Your ‘American Government’ class didn’t discuss the Constitution? I call BS.
. . . was never discussed in my school days; at least I can’t recall anything.. . . and I don’t remember anythng of the sort being mentioned.About the only thing I vaguely recall was that . . . but I don’t remember anything going deeper than that. Slept through class, perhaps? Your school must be very proud. I have allways wondered how children to single mothers and unknown (undeclared) fathers fit into the birther interpretation of “children to citizen parents”, which according to them means “children to 2 citizen parents”. forgot to mention that “children to citizen parents” is Vatellism, not law of the land. Because that’s what it must translate to in order to give the Vattel meme a necessary grain of truthiness. If this birther stuff was complete, 100% BS—as opposed to merely 99%—it wouldn’t be so believable. I tried very hard to type that with a straight face.